I’ve created a list of my favorite 8 new technical features, my “gems". In this series of posts, I will show you them and dive a little bit into their technical details. In this fourth episode, we will talk about the support for vSphere tags. Modern datacenters are becoming complex, and regardless the efforts of their managers and operators to reduce their complexity, the only way to effectively manage these large environments is through automation. Automation is not just about scripting repetitive tasks; the proper way to automate a datacenter is by creating policies to describe a desired state, and then have a smart software in place capable of applying “automatically” those policies against different components of the infrastructure. In this way, an administrator has to take care of the policies and their assignments, instead of “baby sitting” the different components. As a fundamental part of any environment, data availability could and should be managed via policies. 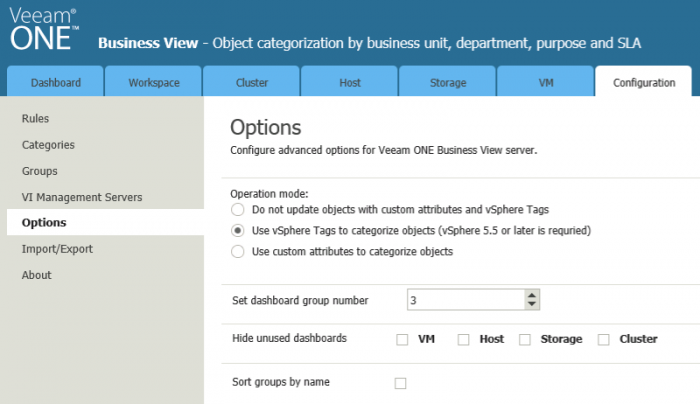 And today I’m going to explain you how you can do it with Veeam Availability Suite v8 and VMware vSphere. Once you populate a job with a tag, each virtual machine with the selected tag will be added to the list of processed virtual machines automatically at each job execution, and properly protected. The possible use cases are endless, but let me give you some example, to better understand the power of tag support into Veeam Backup & Replication. For example, you may want to leverage the new v8 SQL Server transaction logs backup functionality for your most important SQL Servers. You configure a backup job to include all virtual machines with “T1SQL” tag with the Logs Backup option configured to backup transaction logs every 15 minutes, and then you just tag your important SQL servers virtual machines with the "T1SQL" tag. 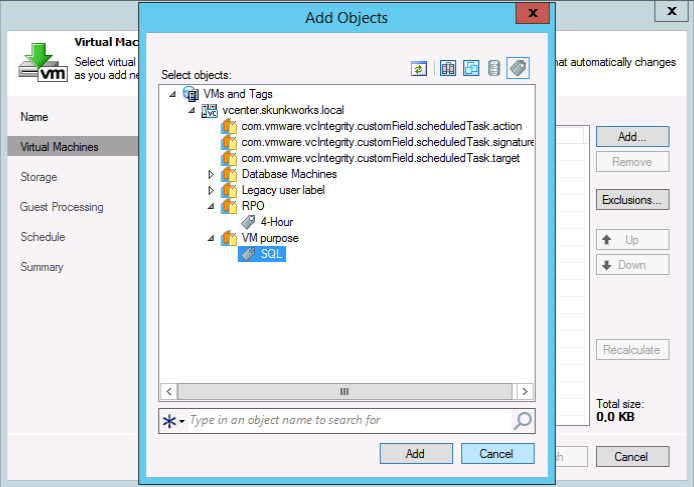 By using this setup, each tagged SQL Server will be protected with the RPO of 15 min or less automatically. Another example: your security policy requires all servers belonging to the Finance department to be saved in encrypted backups. You don't want to encrypt all your backups, just this one. You can create a new backup job where encryption is enabled and configured, and then you simply select the tag "Finance" in the "Department" category as the dynamic scope of virtual machine selection. All virtual machines with this tag will be protected by this job, and the backup files will be encrypted. And last example: you have some virtual machines you want to replicate in your Disaster Recovery site every 4 hours. Tags are supported in Replication jobs as well, so again you create a Replication job populated with a "4 hours replication" tag, and the job will automatically pick up the virtual machines tagged with the corresponding tag. The beauty of tags is that they are truly dynamic in nature, and so are queried each time a job is executed; in this way, each virtual machine that was just tagged is immediately added to the correct job without any job editing required. Say you have two tags like "24 hours RPO" and "4 hours RPO": with the former you select virtual machines that are saved once a day, and with the latter machines that are saved every 4 hours. After some time, your company realizes that a virtual machine has become too critical to be protected with a daily backup. By simply removing the former tag and applying the latter, immediately the virtual machine starts to be protected with the job running every 4 hours. And all of this without ever modifying any backup job that you initially created. 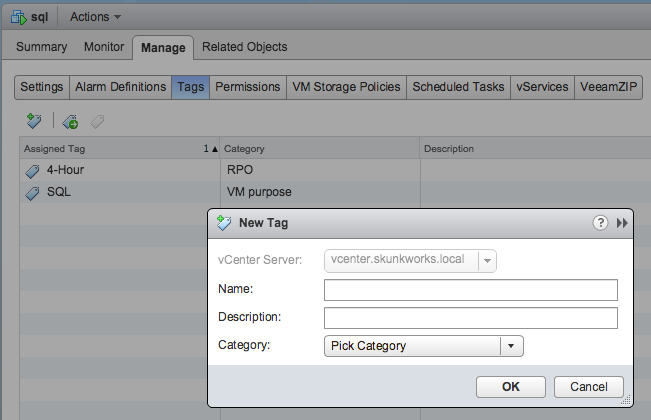 How do I tag a virtual machine? In this way, an Application Owner could tag his own virtual machines running Microsoft SQL Server for example. This is a quick and effective way to start creating categories and groups that can be later used in other activities. 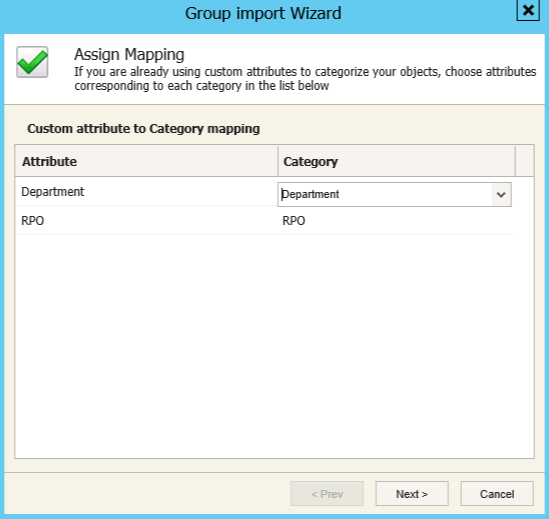 And if you already have used extensively vSphere tags, there's no reason to do the job twice: Veeam ONE has a wizard to map tags created in vSphere to corresponding categories and groups in Business View. Pretty cool capability! In fact, I am not aware of any other product out there that can provide such a comprehensive vSphere tags management story. Please correct me in comments if I am wrong. Thanks to vSphere tags integration in both Veeam Backup & Replication and Veeam ONE –regardless if you are a service provider, or your department is acting like an internal provider for your different lines of business, you can now offer advanced data protection services with proper separation of duties. Data protection administrators can setup and manage policies, while application owners can independently decide the best policy for their workloads. It’s no secret that modern datacenters are moving towards a policy-based management; with Veeam Availability Suite v8, now you can have a real policy-based data protection of your vSphere virtual machines in place.